Like many Argentine artists of his generation, Pablo Curatella Manes lived in Europe and immersed himself in the avant-garde. His admiration for both Renaissance art and Cubist sculpture led him to find his own artistic voice. In The Guitarist, one of his first Cubist works, Curatella Manes transformed musician and instrument into a series of clearly defined yet simplified geometric solids. The artist sought a modern classicism, balancing figuration and abstraction, solidity and movement. The apparent heaviness of the bronze makes the figure stable, while the distribution of volumes follows a syncopated rhythm that reinforces the musical theme. 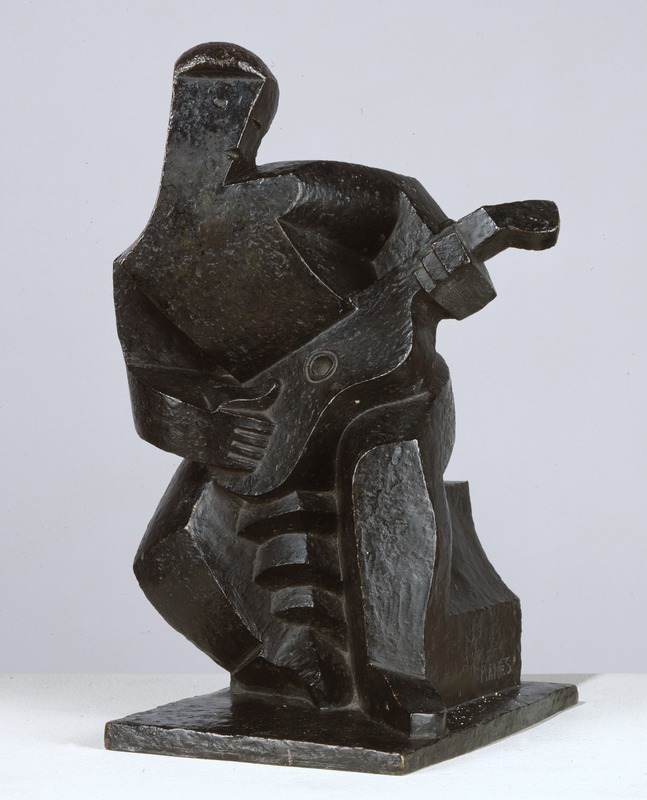 Pablo Curatella Manes, “El guitarrista [The Guitarist],” Blanton Museum of Art Collections, accessed April 26, 2019, http://utw10658.utweb.utexas.edu/items/show/2768.